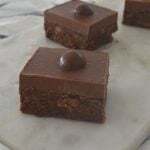 Introducing the BEST Thermomix Mars Bar and Maltesers Slice recipe – seriously! It’s been five years now since I first shared the recipe for my original Maltesers and Mars Bar Slice recipe and I really can’t believe it’s taken me this long to share the Thermomix version!! This easy no bake slice recipe is certainly not for those who are watching their sugar or chocolate intake as it’s packed full of Mars Bar and Maltesers pieces and topped with not one, but TWO blocks of milk chocolate. It’s pretty obvious that I love all things Mars Bar and Maltesers (make sure you check out this Maltesers and Mars Bar Cheesecake for example!!) This Thermomix Mars Bar and Maltesers Slice only takes around 20 minutes to put together from start to finish, the hardest part is waiting for it to set in the fridge. Although I do love to use my Thermomix to make recipes, when it comes to melting the chocolate for the top layer of this slice, I think it’s actually easier to melt it in the microwave. The use of coconut oil is optional, I find that adding it helps prevent the chocolate layer from splitting when cutting it into pieces. You may need to mix your Mars Bar pieces for longer to roughly chop if they have been stored in the fridge. You can also use just one block of chocolate for the top layer if your prefer. This slice is also great when decorated with chopped up Mars Bar and Maltesers pieces. You can use any size tin to make this recipe, however please be mindful a smaller tin will result in a ‘thicker’ slice. You can find the conventional cooking instructions for this recipe here. This Thermomix Mars Bar and Maltesers Slice recipe is seriously the best!! It's filled with yummy Mars Bar and Maltesers pieces and then has a thick chocolate layer with more Maltesers on top - what more could you want?! Line the base and sides of a 28 x 18cm slice tin with baking paper. Place the Mars Bars into your Thermomix bowl and mix for 3 seconds on speed 5 to roughly chop. You may need to mix for a little longer if they have been stored in the fridge. Transfer to a separate bowl until needed. Without washing the bowl, add the chocolate ripple biscuits and mix for 7 seconds, speed 7 to crush. Add the Maltesers (150grams) and mix for 4 seconds, speed 4 to roughly crush. Transfer to the bowl with the Mars Bar pieces. Without washing the bowl, add the butter and sweetened condensed milk and cook for 3 minutes, 70 degrees, speed 2. If the mixture hasn't quite melted, cook for a further 2 minutes, 60 degrees, speed 2. Return the crushed biscuits, Mars Bars and Maltesers to the Thermomix bowl and mix for 10 seconds, speed 4 , REVERSE to combine. Scrape down the sides of the bowl and mix for a further 5 seconds, speed 4 REVERSE. Pour the mixture into the slice tin (don't worry it will be sticky) and flatten with the back of a metal spoon. Break the milk chocolate into squares and place it along with the coconut oil (if using) into a microwave safe bowl and cook for 30 seconds spurts (stirring in between) until melted. Put the slice back into the fridge and allow it to chill for a minimum of three hours before cutting into pieces. - You will have plenty of Maltesers (and some leftover!) if you buy a family pack. - This slice will keep for up to one week when stored in an airtight container in the fridge. For more easy Thermomix slice recipes, check out our Thermomix Slices Book – also available in a bundle.